1Test the range of brightness controls. Many cameras include a brightness control that allows you to increase the brightness of the LCD to make it easier to view in full sunlight, or to decrease the brightness indoors to use less battery juice. 2Look for a swivel mount, if you want (like the one shown in this figure). 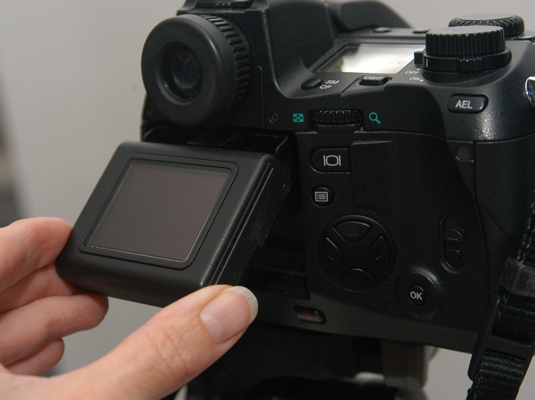 Some LCDs swivel and rotate, allowing you to point the camera in one direction and move the LCD so that you can easily view it at an angle. 3Decide what resolution and size LCD you need. 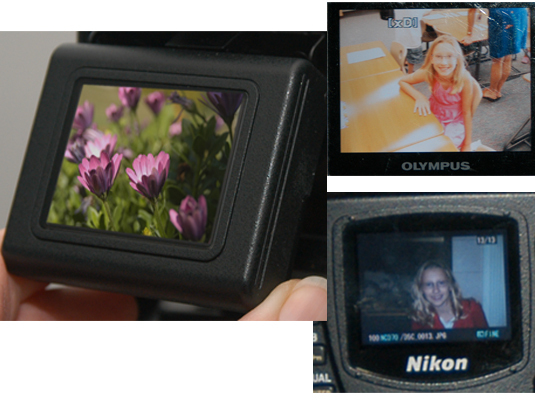 The size of the LCD and the number of pixels it contains will partially determine how easy it is to preview your image. This figure shows a number of different LCD screens. Some digital cameras update their LCD images more efficiently, so the view is smooth even when the camera or your subject is moving. Others offer up blurry images or ghost trails that make it difficult to view images in motion. 5Stay away from cameras with vanishing images. Ideally, the LCD should display a real-time image right up until the instant before the picture is taken. 6Test the accuracy of the LCD viewpoint and rendition. The LCD might not display 100 percent of the sensor’s view, or reflect how the colors or brightness of the actual image.